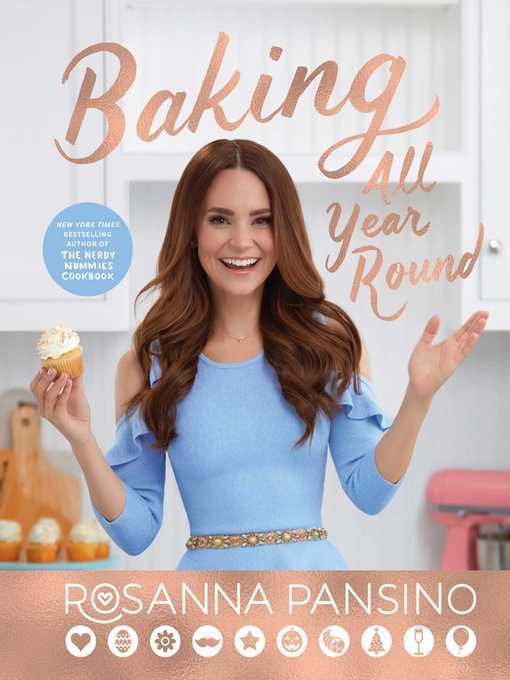 In this book you will find more than 85 recipes for many of the holidays and special occasions that Rosanna Pansino's family celebrates, such as Christmas, New Year's, Valentine's Day, birthdays, Mother's Day, Father's Day, and more. It will be your guide for years to come with fun, creative, and delicious ideas to make and share. This book has everything you'll need to make a lasting impression. It's also sprinkled with several recipes that are either gluten-free, dairy-free, or vegan, so there's something for everyone to enjoy and celebrate all year round! Rosanna Pansino is an award-winning YouTube star, baker, entrepreneur, and author. Her first book, The Nerdy Nummies Cookbook, is a New York Times bestseller. She also created and hosts Nerdy Nummies, the internet's most popular baking show. Pansino launched her YouTube channel in 2011 and since then her videos have been viewed more than 2.5 billion times. With more than 10 million subscribers, Rosanna is one of the most-watched and followed personalities on the internet. In 2015, she executive produced and hosted two holiday food specials on the Cooking Channel. In 2017, she partnered with Wilton to launch her own branded line of baking tools and was named the top food influencer of the year by Forbes. She currently lives in Los Angeles with her family and dog Cookie. Pansino’s second cookbook (after The Nerdy Nummies Cookbook) is a delightful celebration of themed baked goods suitable for a myriad of occasions, including baby showers, birthdays, and religious holidays. Throughout, Pansino creatively utilizes store-bought candies for her confections: she uses Reese’s Pieces to create corn kernels for harvest corn–shaped peanut butter cookies; mini Cadbury eggs are painted to look like baby chicks for chocolate-coconut nest cookies; and Tootsie Rolls are formed into mini grilled hamburgers atop BBQ Grill Cupcakes (for Father’s Day). Many of the recipes require careful attention, such as Save-the-Date lemon sablé cookies (imprinted with a calendar and an event date), Conversation Heart petits fours, and a spiced reindeer-shaped cake, but all include step-by-step photographs. Pansino also includes several gluten-free, dairy-free, and vegan recipes, such as wine gummy bears, strawberry champagne macarons, and salted whiskey caramels. Pansino’s anecdotes and family photos are as adorable as her culinary creations (“My elementary school teacher asked me what my favorite subject in school was and I answered ‘Snack Time!’ ”). From simpler projects like maple pecan blondies to more intricate ones like a beehive-shaped baby shower honey cake, this book will inspire bakers of all levels.